Black Rose Earrings. Dangle Earrings. Black Earrings. Black Flower Earrings. Silver Lever Back Earrings. Handmade Jewelry. 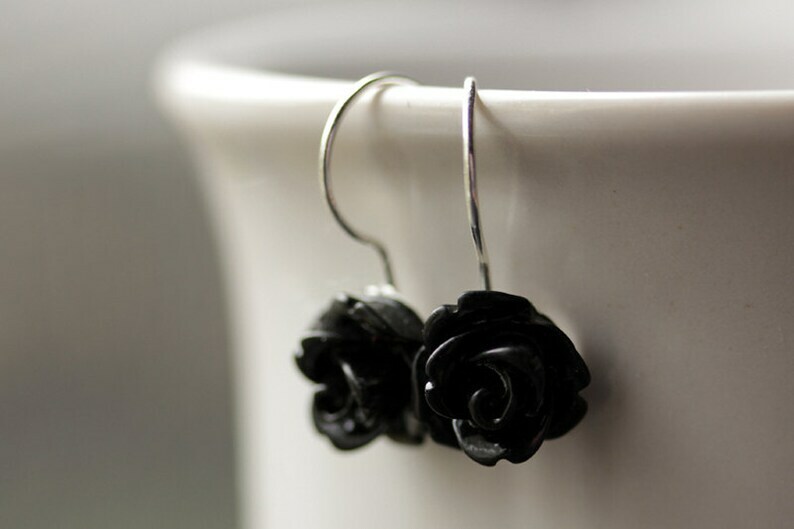 Delicate black resin roses have been used to create these feminine flower earrings with silver plated lever back ear hooks. Hot Pink Rose Earrings. Dangle Earrings. Hot Pink Earrings. Hot Pink Flower Earrings. Silver Lever Back Earrings. Flower Jewelry. Ivory Rose Earrings. Dangle Earrings. Ivory Earrings. Ivory Flower Earrings. Silver Lever Back Earrings. Flower Jewelry. Handmade Jewelry. Brown Rose Earrings. Dangle Earrings. Brown Earrings. Flower Earrings with Silver Lever Back Hooks. Flower Jewelry. Handmade Jewelry. Aqua Rose Earrings. Dangle Earrings. Aqua Earrings. Flower Earrings with Silver Lever Back Hooks. Flower Jewelry. Handmade Jewelry. White Rose Dangle Earrings. White Flower Earrings. Rose Earrings. White Earrings. Silver Lever Back Earrings. Flower Jewelry. Red Rose Dangle Earrings. Red Flower Earrings. Rose Earrings. Red Earrings. Silver Lever Back Earrings. Flower Jewelry. Handmade Jewelry. Yellow Rose Dangle Earrings. Rose Earrings. Yellow Earrings. Silver Lever Back Flower Earrings. Flower Jewelry. Handmade Jewelry. Lovely earrings, and great customer service. These tiny earrings are really cute and go with a lot of my outfits, and I appreciate the lever back. Gray Rose Earrings. Dangle Earrings. Grey Earrings. Gray Flower Earrings. Silver Lever Back Earrings. Flower Jewelry. Handmade Jewelry. Black Dahlia Flower Earrings. French Hook Earrings. Black Flower Earrings. Lever Back Earrings. Handmade Jewelry. Black Flower Earrings. Rhinestone Daisy Earrings in Black on Silver Stud Earrings. Black Earrings. Handmade Earrings. Handmade Jewelry. White Dahlia Flower Earrings. French Hook Earrings. White Flower Earrings. Lever Back Earrings. Handmade Jewelry. Lotus Rose Earrings in Black with Silver Stud Earrings. Floral Jewelry. Handmade Jewelry.